Create Your Seal with KEL-EEZ® Weatherization Sealer Products!!! Welcome to KEL-EEZ® Sealer Products. We offer a variety of products to seal Entry and Overhead Door Frames and Bottoms. KEL-EEZ® Sealer Products seal out Rain, Dust, Dirt and Insects. Prevent Heat and Cooling loss and Install Quickly. The seals are for use on all types of Interior and Exterior doors. The Frame is Engineered from Composite Thermoresin in Colors of Cream White and Olive Brown or a High Quality Mill Finish or Gold Anodized Aluminum. The Door Bottom Insert is Engineered from Weather Resistant Brush or Flange. The Door Frame Insert is Engineered from Weather Resistant Brush or Bulb. Custom Composite Colors for the Frame are available. KEL-EEZ® offers durable brush, metal and rubber products at an economical price to help seal Doors and Overhead Garage openings. Energy costs can be cut by as much as 25% to 40% in keeping doors and windows sealed. Heat transfer around door openings is one of the primary sources of energy loss. Heat loss occurs with the movement of air through unsealed openings. Stopping the movement of air will substantially stop the transfer of heat. KEL-EEZ® Sealer products come with enclosed screws to secure the Sealer Product to the door frame or bottom. Custom Adhesive Backed Sealer Products are available. In summer- Sealed openings lower air conditioning costs through the use of Air Tight Seals and help stop other contaminants from entering the household like dust, dirt and insects. In Winter- Sealed openings offer a warmer environment at a lower cost. Through the use of these seals, cold drafts can be stopped from the outside environment and from other colder areas of the house. A cold and drafty building can become comfortable through the use of KEL-EEZ® Door Sealer Products. Consider these seals in your environmental control efforts. 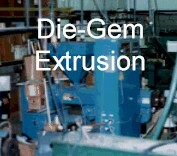 KEL-EEZ® Weatherization is a Division of The Die-Gem Company. Thank you, KEL-EEZ® Weatherization Personnel. KEL-EEZ® Weatherization will Package and Ship your Sealer Products anywhere in North America. Will help you inquire about your sealer needs. You will find that our prices are very competitive. If you have a question or would like to tell us what you think about our web site, our products, our organization, or anything else that comes to mind, we welcome all of your comments and suggestions. KEL-EEZ® Weatherization will design and manufacture the Seal for you. KEL-EEZ® Weatherization Manufacturing Facilities are Located in Akron Ohio. Homeowners "Replace Your Old and Drafty Windows and Increase the Value of your House"
With KEL-EEZ® Custom Manufactured Vinyl Windows. 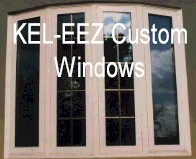 KEL-EEZ® Weatherization Will Custom Manufacture Your Seal!! !